Even the big kids need a holiday-themed activity. This FREE cut-and-paste activity gives you two choices for practicing multi-step equations. 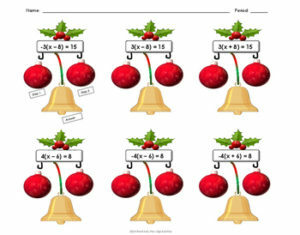 One activity includes distributive property and equivalent equations, while the second focuses more on the steps for solving two-step equations. These options allow you to more easily differentiate to best meet the needs of all your students. The first problem of each worksheet is labeled to help student know where step 1, step 2, and the answer goes. A full answer key is included.